The temperature setting of the seat changes according to the switch position. If you want to cool your seat cushion, press the switch (blue color). When pressing the switch for more than 1.5 seconds with the seat air ventilation operating, the seat air ventilation will turn OFF. 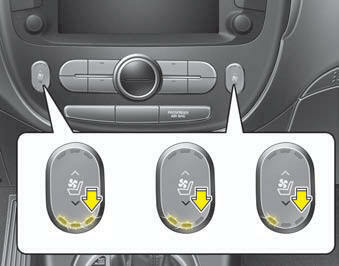 The seat air ventilation defaults to the OFF position whenever the ignition switch is turned on. When cleaning the seats, do not use an organic solvent such as paint thinner, benzene, alcohol and gasoline. Doing so may damage the air ventilation seat. Do not place heavy or sharp objects on the seat. Those things may damage the air ventilation seat. Be careful not to spill liquid such as water or beverages on the seat. If you spill some liquid, wipe the seat with a dry towel. Before using the air ventilation seat, dry the seat completely.